High productivity through big cleaning path and big tank capacity makes it suitable for cleaning in large and dirty environment. With this large-sized walk-behind scrubber dryer you can easily clean floors in tough and dirty environments.The FANG 32T is easy to manoeuvre and easy to use.With variable pad pressure you can easily adjust to your specific cleaning needs. For very dirty areas just add more pressure. 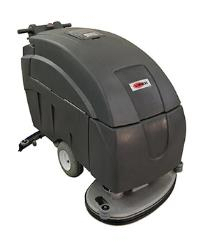 Furthermore the machine has a transaxle drive system with variable speed drive.A big tank capacity and longer battery run time makes it possible to clean for a longer time.You will find it ideally suitable for scrubbing and drying in tough and dirty environments such as building contractors and industrial environments. Variable pad pressure makes it possible to adjust to your cleaning needs.For more dirty areas just add more pad pressure.